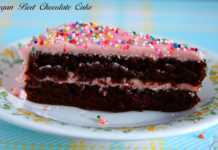 I came across few beet brownies and beet chocolate cake recipes a few days ago. I had a cup of pureed beets in the freezer and wanted to use it up and since it’s been a while since I made brownies, beet brownies it was. 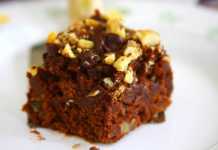 So I was browsing through one of my favorite books “Deceptively Delicious“, and my eyes fell on the brownies recipe. It used 1/2 cup each carrot puree and spinach puree. I thought why not use the 1 cup of beet puree instead. 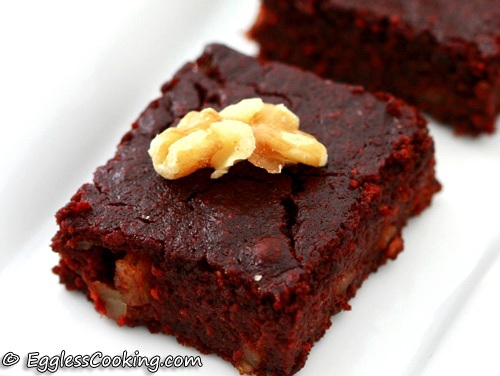 I’m glad that I tried this beet brownies because it turned out very tasty. Pumpkin puree and sweet pototo puree are very good alternatives too. 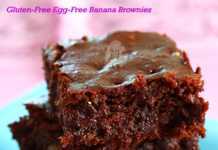 Want to make healthy brownies without compromising the taste? 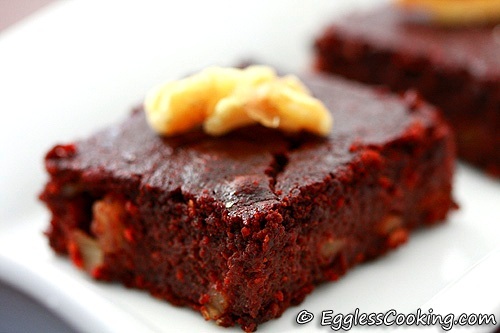 These egg free, oat flour brownies loaded with beet puree just does it. Pumpkin puree or sweet potato puree works fine too. Preheat the oven to 350F for 15 minutes. Coat an 8-inch square pan with cooking spray. For brownies I line the pan with aluminum foil and grease it with cooking spray, so cutting it is easy and also we can get perfect squares. Melt the chocolate in a double boiler or over a very low flame. I melted the chocolate in the microwave oven, in a medium-size bowl. Take care while doing so or else the chocolate will get burnt. So increase the time little by little. Stir it well, it should be smooth. In the same bowl, combine the beet puree, sugar, cocoa powder, margarine, vanilla, and unsweetened applesauce and whisk it well. This mixture should be smooth and creamy. Stir in the oat flour, baking powder, chopped walnuts and salt with a wooden spoon. Pour the batter into the prepared pan and baked 35-40 minutes. I checked it after 35 minutes and felt that it was not done. Brownies should spring back when touched, but it did not. So baked it for another 5 minutes. Cool completely in the pan on a wire rack. Since I lined the pan with aluminum foil, I lifted it after an hour, and I cooled it on a wire rack. After another 2 hours, I was able to cut them into neat squares without any trouble. If baking it directly in the pan, it will take some more (actually a lot more) time for the brownies to cool completely and getting neat pieces will also be difficult. The taste was simply superb. The oat flour or the beet puree did not affect the taste at all. It tasted like any other regular brownie. The only difference I felt was in the texture, but it was nothing huge. The brownies were chewy and also pudding(y) in the middle. I don’t mean that it was in a semi-solid state, it had set properly, but the texture was a bit different than the usual brownies, which I think is because of the beet puree. Also, the brownies are more reddish than brown. This did not stop my son or the rest of us from finishing it off. I have used 1/4 cup unsweetened applesauce instead of 2 egg whites mentioned in the original recipe. If you have extra beet puree, you can use 1/4 cup of that itself. I had only 1 cup of beet puree so I used applesauce. Oat flour is readily available in stores. I didn’t have that in hand, so I powdered quick cooking oats in a blender. Be sure to powder it finely, sieve it a couple of times. You can use all purpose flour too instead of oat flour. To prepare beet puree you can either buy canned beets and blend it smoothly in a blender or do like what I did. I peeled and cooked the beets in a pressure cooker. 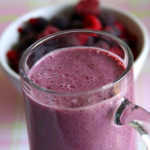 Cut into small pieces once cooled and then blend it. I had prepared this a month back. So I put it in a cup, covered with plastic wrap and froze it. To use the puree, thaw it in the fridge overnight and by the following afternoon it should be alright. great recipe.made it several times now.but can these be frozen? Thanks Elisa. Yes, freezing should be ok.
Would make again! Recipe was epic. Used plant oil instead of margarine and normal flour instead of bean flour. These are wonderful! I’ve used GF all-purpose flour in place of the oat flour with great results, but the oat flour is also great. My only suggestion is to stir the margarine or butter into the melted chocolate first, before the other ingredients, so that it melts from the heat of the chocolate. I use 3 oz of semisweet chocolate chips, and melt them in in the microwave in a 4c measuring cup. That’s a big enough container to add all of the other ingredients without having to wash another bowl. 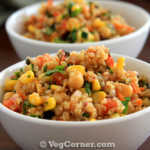 Love your recipe and would like to try this. Can I replace margarine spread with unsalted butter? Thanks Kavi and yes of course. I am using canned beets, do I drain the liquid or puree it all together????? I guess so Michelle. Just reserve some of the water to make blending easier. Thanks for rating the recipe, Snehal. I like to make this for my daughter’s second birthday. How long I can store this for? The birthday is on Jan 7th. Also, I hope I can use cashews instead of walnuts. Hi Sasi, in our house we finish off the brownies within 3 days. I think it will keep good for about a week in the refrigerator and maybe even more in the freezer. But haven’t tried both. show. All of her recipes are eggless and healthy cooking. I checked the recipe Neela. That’s a very good one. Thank you very much for the link. I used to watch her show regularly when we were in the US. You are more welcome; aren’t you in US. 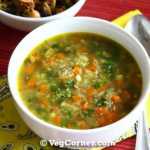 This is an awesome recipe… Loved it. I made a few changes to the recipe though. I had some cocoa powder that was very strong and bitter (Green n Black organic cocoa powder) so instead of buying semisweet chocolate. I used part of the 1/4 cup of powder and mixed with some honey to make it into a thick paste like consistency. That’s a great idea Sindhu. Hi Madhu where can I find oat flour I looked in walmart I did not find. Asha, you can find it in the regular grocery stores itself, most probably in the organic aisle or in Whole Foods, Trader Joes. You can very much make it at home too. Simply process quick cooking oats in a food processor and sift it before using. 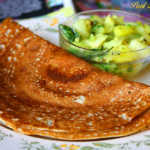 For this recipe I too made it at home only. Hi Madhuram the brownies looks good, I have a question if we are adding cocoa powder do we still need to add the chocolate, do we use baking chocolate or regular chocolate. I would like you to check this recipe I found on this web site. This is also a good recipe I have tried the cupcakes it did come out good. I have to try brownies too. Thanks for the links Asha. I did check the recipe and it looks very simple, though I think I would use something instead of the corn syrup. Th beet gives it a really nice colour. These are unique and I want to try them, sounds interesting, and they look dense and tasty! Have always been a silent reader of your blog. I do bake sometimes and always would prefer to bake without eggs.Beets, walnuts and oats are my fav.This is just like a triple delight.Thanks for sharing the recipe.